The U.S. bank prime rate remained at 3.25 percent throughout the second half of February. The average credit card rates in this survey were essentially unchanged over the past two weeks, with just a one basis-point adjustment in the student credit card category. This was due to a consolidation of credit card offers from one company, rather than an actual change in the rates of any of the offers tracked by this survey. Has the economy completely lost momentum? The economy's growth rate accelerated throughout most of last year, but so far this year just about every economic indicator, including GDP growth, employment and manufacturing activity, has been disappointing. Stronger growth was instrumental in pushing many interest rates higher last year, but that upward course paused as signs of growth started to fade. Now the question is whether economic growth has simply leveled off, or will start to drift back down towards recessionary territory. While that question is being resolved, interest rates seem to have settled into something of a holding pattern. How much of the economy's recent struggle is due to the weather? One reason it is tough to know what to make of all the disappointing economic news is that this has been an extraordinarily harsh winter throughout most of the country. Many observers are quick to conclude that the weather has been responsible for putting a chill on the economy. The premise is that like everything else, the economy will thaw out come springtime and start to move again. However, that explanation might be a bit too pat. Most economic indicators are seasonally adjusted, so while a particularly harsh winter can have an effect on the numbers, some expectation of cold weather is already built into how the figures are reported. Also, if the harsh winter is suppressing economic activity, it does not necessarily follow that things will pick up where they left off come the spring. Economic activity can be a bit like the engine in an old car -- once it stalls, it can be temperamental about starting back up again. The wild card in this discussion is inflation. Economic growth can have offsetting impacts on credit card rates -- it increases demand but also improves credit quality. In contrast, the impact of inflation is unambiguously to push rates higher. Inflation has been unusually mild, but fuel prices have been on the rise in February. So, while waiting for the growth question to resolve itself, it is possible that the economy might be blindsided by a flare-up of inflation. Consumer credit card rates have been unchanged since last October, at 15.48 percent for non-rewards credit cards, and 17.64 percent for rewards credit cards. The average student credit card rate had the slightest increase possible, rising by one basis point to 17.56 percent. This was due to a consolidation of two essentially identical credit card offers. 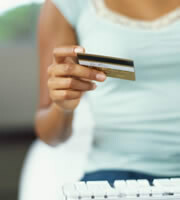 Rates on business non-rewards and rewards credit cards remained unchanged throughout February. The spread between rates for customers with excellent credit and the overall average remained at 3.93 percent. 0 Responses to "Credit card rates wait out the cold weather"